The private pilot obtained a full weather briefing before departing on a long cross-country flight. The destination airport was forecast to be under visual meteorological conditions, but there was an AIRMET and Center Weather Advisory (CWA) issued for low instrument flight rules (IFR) conditions later that day. The briefer told the pilot to check the weather again en route to see if the AIRMET and CWA had been updated. At the time the pilot stopped for fuel, another CWA was issued for low IFR conditions at his destination airport; however, there were no records to indicate that the pilot obtained this information during the fuel stop or after departing on the last leg of the flight. A review of air traffic control communications revealed that, about 10 minutes before arriving at the airport, the pilot reported that he had obtained the current weather conditions at his destination airport. The most recent observation, about 1 hour before the accident indicated good visibility; however, the weather reporting equipment did not provide ceiling heights. It is unknown if the pilot obtained weather information from nearby airports, which were reporting low instrument meteorological conditions (visibility between 1/4 and 1/2 mile and ceilings 200-300 ft above ground level [agl]). Additionally, three pilot reports (PIREPs) describing the poor weather conditions were filed within the hour before the accident. 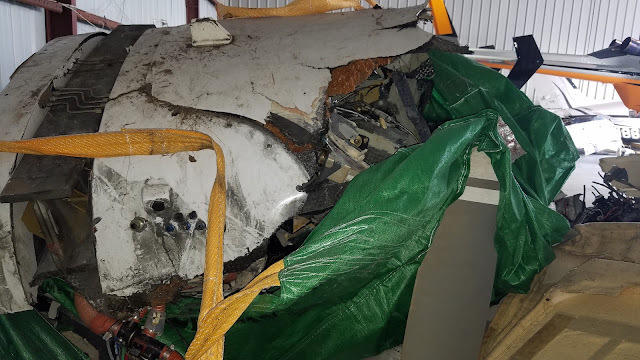 The controller did not relay the PIREPs or the CWA information to the pilot, so the pilot was likely unaware of the deteriorating conditions. Based on radar information and statements from witnesses, the pilot's approach to the airport was unstabilized. He descended below the minimum descent altitude of 440 ft, and, after breaking through the fog about 100 ft agl, the airplane reentered the fog and completed a 360° right turn near the approach end of the runway, during which its altitude varied from 100 ft to 300 ft. The airplane then climbed to an altitude about 800 ft before radar contact was lost near the accident site. The airplane came to rest inverted, consistent with one witness's statement that it descended through the clouds in a spin before impact; postaccident examination revealed no preimpact anomalies with the airplane or engine that would have precluded normal operation. Although the pilot was instrument rated, his recent instrument experience could not be established. The circumstances of the accident, including the restricted visibility conditions and the pilot's maneuvering of the airplane before the impact, are consistent with a spatial disorientation event. It is likely that the pilot experienced a loss of control due to spatial disorientation, which resulted in an aerodynamic stall and spin. The pilot's loss of airplane control due to spatial disorientation, which resulted in the exceedance of the airplane's critical angle of attack and an aerodynamic stall/spin. Contributing to the accident was the pilot's failure to fly a stabilized approach consistent with the published instrument approach procedure. 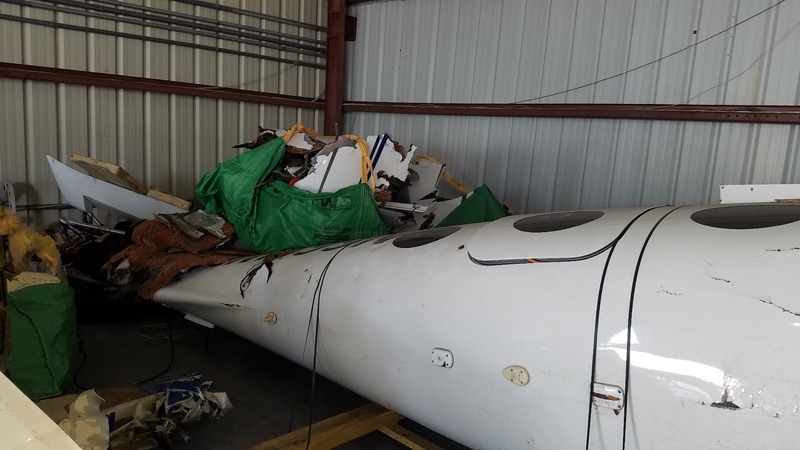 On December 27, 2016, about 1756 eastern standard time, an experimental, amateur-built Epic LT airplane, N669WR, sustained substantial damage when it impacted terrain during an instrument approach to Spruce Creek Airport (7FL6), Port Orange, Florida. The private pilot and passenger were fatally injured. The airplane was privately owned and was operated by the pilot under the provisions of Title 14 Code of Federal Regulations (CFR) Part 91. 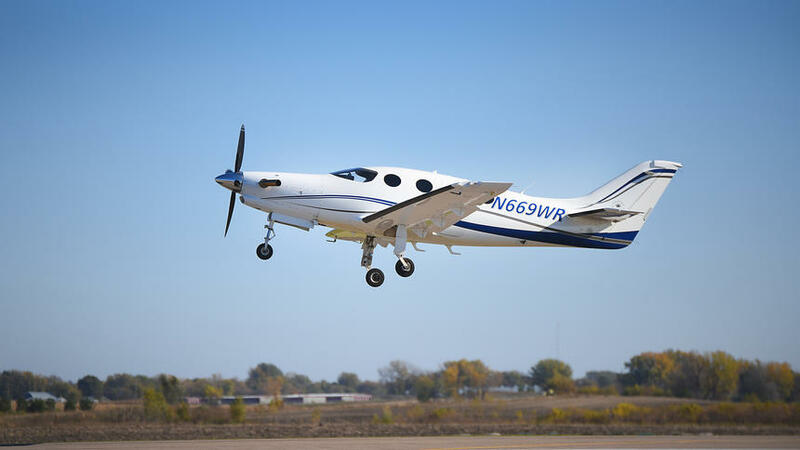 Instrument meteorological conditions prevailed, and an instrument flight rules (IFR) flight plan was filed for the personal flight, which originated from Millington Regional Jetport (NQA), Millington, Tennessee, about 1558, and was destined for 7FL6. The pilot initially departed from Willmar Municipal Airport (BDH), Willmar, Minnesota, on the morning of the accident, with a planned stop at NQA before proceeding to 7FL6. The pilot received a weather briefing from Lockheed-Martin Flight Service at 1249 before departing BDH. The information provided to the pilot indicated that the terminal area forecast (TAF) predicted visual flight rules (VFR) conditions until 2300; however, an AIRMET and a Center Weather Advisory (CWA) called for low IFR conditions at 7FL6. The briefer told the pilot to check the weather again en route to see if the AIRMET and CWA had been updated, because the CWA was only valid for 2 hours and any new AIRMETs would be released at 1545 or earlier. The pilot landed at NQA about 1529 and subsequently departed about 1558. There were no records to indicate that the pilot obtained updated weather information during this time. At 1555, a CWA for low IFR conditions (ceilings below 500 ft and visibility below 1/2 mile in fog) was issued and was valid for the accident site until 1755. Another CWA was issued at 1700 and valid until 1900 regarding low IFR conditions. A review of air traffic control communications provided by the Federal Aviation Administration (FAA) revealed that, about 1741, the pilot told the approach controller that he had the current weather conditions at 7FL6 and the "visibility to get in there." The controller did not provide the pilot with the 1700 CWA. The controller gave the pilot vectors to the final approach course, provided missed approach instructions (fly heading 070° and climb to 2,000 ft), and cleared the flight for the approach. Once the airplane was established on the final approach course, the controller told the pilot that a frequency change was approved. The pilot acknowledged and said that he would call on the ground and cancel his IFR flight plan. There were no further communications from the pilot. A review of radar data revealed that, during the final 46 seconds of flight, the airplane approached the airport on a northeasterly heading just north of the final approach course. At 1756:01, the airplane was abeam the runway numbers at an altitude of 100 ft mean sea level (msl) (76 ft above ground level) before it initiated a climbing right turn. During the turn, the airplane initially climbed to 200 ft msl then descended to 100 ft msl before climbing up to 300 ft. After completing a 360° turn, the airplane began to climb on a northeasterly heading. Over the next 14 seconds, the airplane climbed to 800 ft, while making a shallow turn to the right followed by a turn to the left before the data ended at 1756:47. The last radar return was near-coincident with the location of the accident site (See figure 1). Figure 1. Radar Flight Track of Attempted Landing at 7FL6. Several witnesses observed the accident. One witness, who was driving to the airport's café, reported that he saw the airplane's landing lights as it approached the airport. The airplane was about 100 ft above ground level (agl) and in a left turn. The airplane then climbed back into the fog layer and disappeared. The witness said, "I didn't hear anything for a few seconds. Then I heard a very loud distinct corkscrewing sound, very familiar to a spinning plane at an airshow. I then saw two wing-tip lights fall through the clouds straight down and heard an extremely loud thud." Another witness, who was an FAA designated pilot examiner, was monitoring air traffic communications on his handheld radio. He stated that general aviation aircraft were diverting to Deland, Florida, and commercial airliners were diverting to Orlando, Florida, due to "below minimum conditions." The witness said that, when he heard the accident pilot was going to attempt the instrument approach into 7FL6, he became concerned and drove to the runway to watch. The pilot, whom he knew, had a history of "careless and reckless" flying, and the witness was convinced he did not have the "skill set" to fly an instrument approach to minimums. The witness saw the airplane when it broke out of the overcast ceiling about 200 ft agl. At that time, the airplane was about 1/8-mile north of the final approach course. He said that the airplane suddenly pulled up (thought maybe the airplane struck trees) and banked to the right over the airport into the fog, before it descended in an inverted flat spin to impact. The witness used his cell phone to record part of the approach. The video was consistent with the witness's statement, and the airplane's engine was clearly heard on the video. A third witness said that he heard a loud engine noise, so he went out onto his lanai and looked up. He saw the airplane emerge from the fog in a 70° to 80° nose-down "fully developed spin." The witness said the airplane made three rotations before he lost sight of it behind trees; he then heard the sound of an impact. Airport surveillance video captured the final seconds of the flight. The video showed the airplane descending through fog in a spin with its landing lights on just before impact. The pilot held a private pilot certificate with ratings for airplane single- and multi-engine land and instrument airplane. His last FAA third-class medical was issued on December 2, 2016. At that time, he reported 5,635 total hours of flight experience. On the pilot's most recent insurance application, dated July 2016, he reported 4,246 hours of flight experience, of which 956 hours were in the accident airplane. The pilot's most recent flight review and Epic Factory Recurrent Training were completed on October 1, 2016. The factory training included both flight and ground instruction. The flight portion included precision and non-precision approaches, unusual attitude recoveries, stall recognition and recovery; however; the pilot's personal logbooks were not available for review and his instrument currency could not be established. The Epic LT was a kit-built, low-wing, single-engine turboprop airplane that seated six. Its structure was carbon-composite material with retractable landing gear. The airplane was equipped with a 1,200-horsepower Pratt & Whitney PT6-67A engine and a four-blade Hartzell propeller. The pilot built the airplane and was issued a special certificate of airworthiness from the FAA on December 18, 2009. A review of the airframe maintenance logbook revealed that the last condition inspection was conducted on August 18, 2016, at an aircraft total time of 822.31 hours. 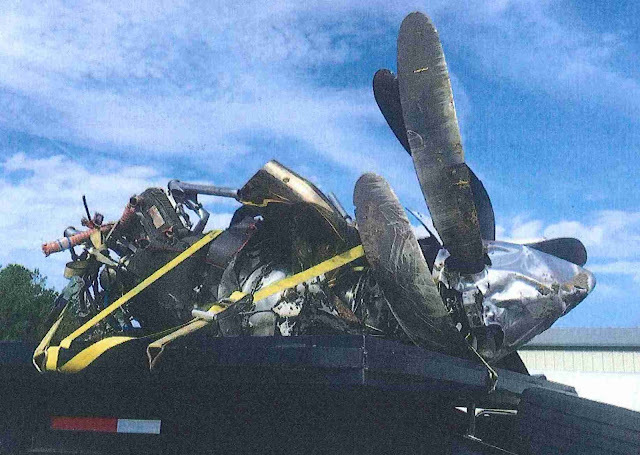 The engine and propeller were inspected on August 17, 2016; both had accrued the same time as the airframe. Whether the pilot obtained additional weather information during the flight to 7FL6 could not be determined. The 1655 automated weather observation at 7FL6 included wind from 070° at 4 knots, visibility 25 miles, temperature 68°F, dew point 65°F, and an altimeter setting of 30.18 inches of mercury. The airport's weather reporting system was not equipped to provide cloud ceiling heights. The 1755 automated weather observation at 7FL6 included calm wind, visibility 2 1/2 statute miles, mist, temperature 67°F, dew point 66°F, and an altimeter setting of 30.18 inches of mercury. 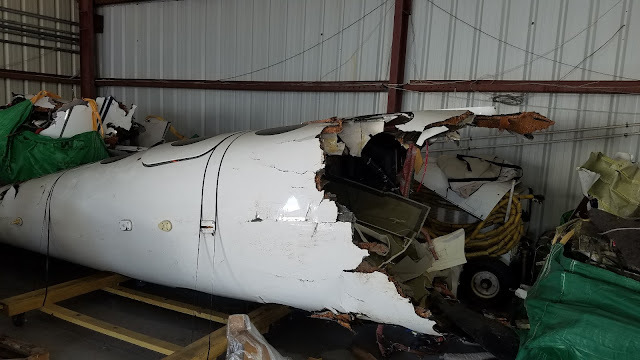 The second closest official weather station to the accident site was at the New Smyrna Beach Municipal Airport (EVB), New Smyrna Beach, Florida, about 5 miles east of the accident site. The 1650 weather observation at EVB included wind from 090° at 4 knots, 1/2-mile visibility, fog, overcast ceiling at 200 ft, temperature 67° F, dew point 67° F, and an altimeter setting of 30.17 inches of mercury. The 1750 weather observation at EVB included wind from 090° at 4 knots, visibility 1/4 statute mile, fog, overcast ceiling at 100 ft, temperature 67° F, dew point 67° F, and an altimeter setting of 30.18 inches of mercury. The third closest weather reporting system was at the Daytona International Airport (DAB), Daytona Beach, Florida, located about 6 miles north of the accident site. The 1726 observation included wind from 090° at 4 knots, visibility 1/4-mile in fog, overcast ceiling 300 ft, temperature 67° F, dew point 67° F, and an altimeter setting of 30.19 inches of mercury. The 1753 observation at DAB included wind from 110° at 5 knots, visibility 1/4-mile in fog, vertical visibility 300 ft, temperature 67° F, dew point 67° F, and an altimeter setting of 30.19 inches of mercury. No AIRMETs were issued or valid for the accident site at the time of the accident; however, an AIRMET for IFR conditions was issued for areas north of the accident site. Three separate pilot reports (PIREPs) that reported low IFR conditions were recorded within 1 hour and in the vicinity of the accident. However, these reports were not disseminated to the pilot by the air traffic controller. According to the U.S. Naval Observatory Astronomical Applications Department, sunset was at 1734 and the end of civil twilight was at 1800. 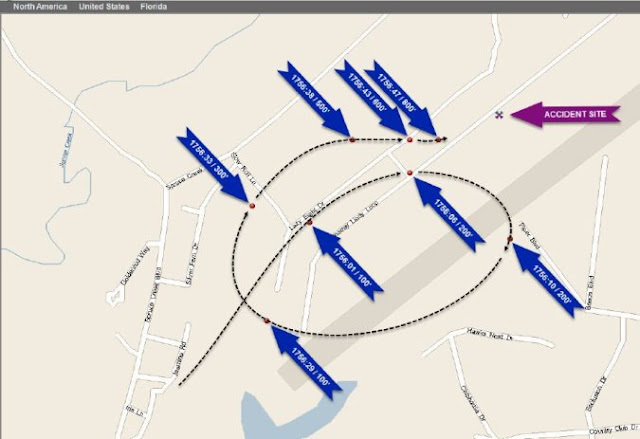 7FL6 was a private, residential airport that has a 4,000-ft-long by 176-ft-wide paved and lighted runway oriented 05/23. The airport was owned and managed by the Spruce Creek Fly-In Property Owners Association. The pilot was a resident of Spruce Creek. The published inbound course for the RNAV (GPS) Rwy 5 approach at 7FL6 was 057° magnetic, and the landing minimums for a straight-in approach were a 440-ft msl minimum descent altitude and visibility 1 statute mile. The airport elevation was 24 ft msl. The approach procedure was not authorized at night. 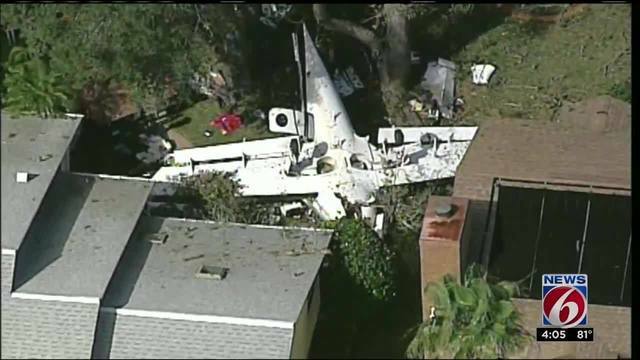 The airplane came to rest inverted at the base of an approximate 50-ft-tall tree on the front lawn of a residence adjacent to the runway. Numerous broken tree limbs were strewn around the accident site. All flight control surfaces were accounted for at the site; there was no postimpact fire. An outboard section of the left wing, a section of the left wing's fuel line, the tail section, and the rudder separated from the airframe. Examination of the airframe revealed that the composite fuselage sustained extensive fracturing. Both wing fuel tanks were breached, and a strong odor of jet fuel was present at the site. Flight control continuity was established from all major flight control surfaces to the cockpit. The landing gear was in the fully down and locked position and the flaps were fully extended. The fuel selector was in the left wing tank position. The electric elevator trim was tested and found in the full tab-down (nose-up) position. The aileron trim was broken from impact and the rudder trim was positioned in a neutral to slight nose-right position. Examination of the airplane revealed no mechanical anomalies that would have precluded normal operation. 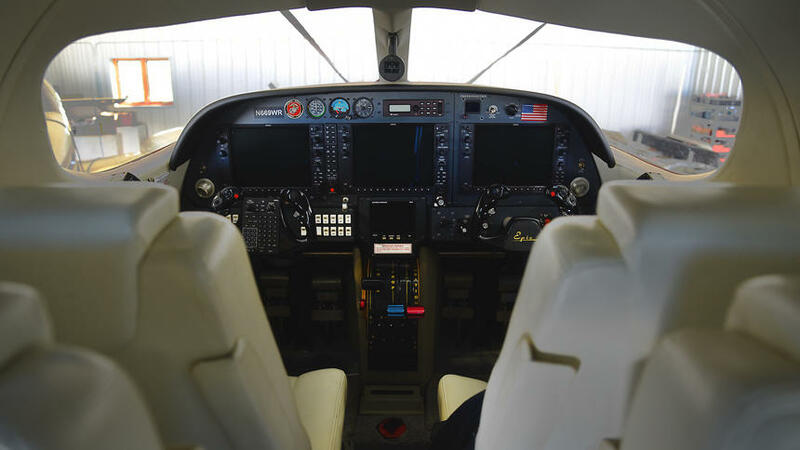 The airplane was equipped with a Garmin G-1000 display. The unit's non-volatile memory card was not located, and no historical flight data was obtained. The engine and the four-blade propeller assembly remained attached to the engine. Each blade was twisted toward the feathered position. Fuel was observed draining from the main fuel line when the engine was separated from the airframe. Visual examination of the engine revealed no mechanical issues that would have precluded normal operation. The airplane was equipped with an Electronics International MVP-50 engine monitor. The unit sustained impact damage and the internal non-volatile memory card was not located; therefore, no historical engine data was obtained. 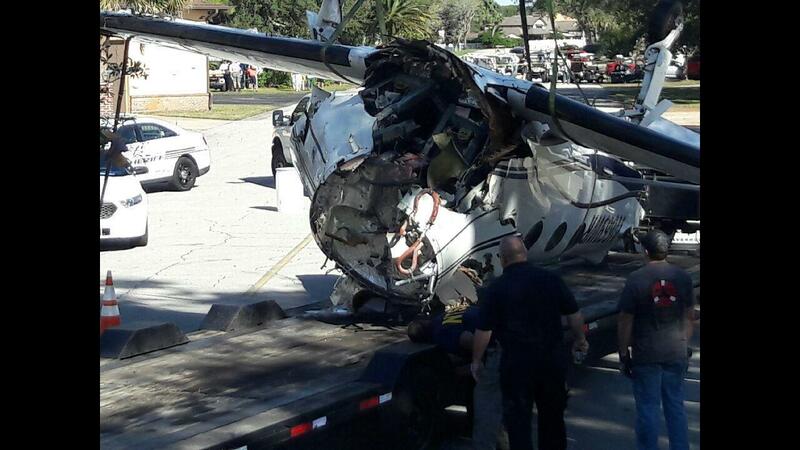 The Office of the Medical Examiner, Daytona Beach, Florida, conducted an autopsy on the pilot. The cause of death was determined to be multiple blunt force injuries. The FAA's Bioaeronautical Sciences Research Laboratory, Oklahoma City, Oklahoma, performed toxicological testing on specimens of the pilot. No carbon monoxide, cyanide, or ethanol was detected in the samples submitted for testing. Ibuprofen, a nonsteroidal anti-inflammatory drug that is not considered impairing, was detected in the pilot's urine. 1. Approach clearance or type approach to be expected if two or more approaches are published and the clearance limit does not indicate which will be used. 2. Runway if different from that to which the instrument approach is made. 4. Ceiling and visibility if the reported ceiling at the airport of intended landing is below 1,000 feet or below the highest circling minimum, whichever is greater, or the visibility is less than 3 miles. 5. Altimeter setting for the airport of intended landing. Significant PIREP information includes reports of strong frontal activity, squall lines, thunderstorms, light to severe icing, wind shear and turbulence (including clear air turbulence) of moderate or greater intensity, volcanic eruptions and volcanic ash clouds, detection of sulfur gases (SO2 or H2S) in the cabin, and other conditions pertinent to flight safety. 1. Ceilings at or below 5,000 feet. These PIREPs must include cloud base/top reports when feasible. TERMINAL. Ensure that at least one descent/climbout PIREP, including cloud base/s, top/s, and other related phenomena, is obtained each hour. EN ROUTE. When providing approach control services, the requirements stated in TERMINAL above apply. 2. Visibility (surface or aloft) at or less than 5 miles. 3. Thunderstorms and related phenomena. 4. Turbulence of moderate degree or greater. 5. Icing of light degree or greater. 8. Detection of sulfur gases (SO2 or H2S), associated with volcanic activity, in the cabin. 9. TERMINAL. Braking Action Advisories are in effect. a. Icing type and intensity. b. Air temperature in which icing is occurring. c. Obtain PIREPs directly from the pilot, or if the PIREP has been requested by another facility, you may instruct the pilot to deliver it directly to that facility. 1. Relay pertinent PIREP information to concerned aircraft in a timely manner. 2. EN ROUTE. Relay all operationally significant PIREPs to the facility weather coordinator. a. The appropriate intrafacility positions. b. The FSS serving the area in which the report was obtained. NOTE−The FSS is responsible for long line dissemination. c. Other concerned terminal or en route ATC facilities, including non−FAA facilities. d. Use the word gain and/or loss when describing to pilots the effects of wind shear on airspeed. Per the FAA Instrument Flying Handbook (FAA-H-8083-16B), the minimum descent altitude (MDA) is "the lowest altitude, expressed in ft msl to which descent is authorized on final approach or during circle-to-land maneuvering in execution of a standard instrument approach procedure where no electronic glideslope is provided. Pilots are cautioned to fully understand and abide by the guidelines set forth in 14 CFR Part 91.175 Takeoff and Landing Under IFR, regarding proper identification of the runway and runway environment when electing to continue any approach beyond the published MDA. 1) The aircraft is continuously in a position from which a descent to landing on the intended runway can be made a normal race of descent using normal maneuvers. 2) The flight visibility is not less than the visibility prescribed in the standard instrument approach being used. (i) The approach light system, except that the pilot may not descend below 100 ft above the touchdown zone elevation using the approach lights as a reference unless the red terminating bars or the red side row bars are also distinctly visible and identifiable. (vi) The visual glideslope indicator. (vii) The touchdown zone or touchdown zone markings. (viii) The touchdown zone lights. (ix) The runway or runway markings. The flight attitude of an airplane is generally determined by reference to the natural horizon. When the natural horizon is obscured, attitude can sometimes be maintained by reference to the surface below. If neither horizon nor surface references exist, the airplane's attitude must be determined by artificial means - an attitude indicator or other flight instruments. Sight, supported by other senses such as the inner ear and muscle sense, is used to maintain spatial orientation. However, during periods of low visibility, the supporting senses sometimes conflict with what is seen. When this happens, a pilot is particularly vulnerable to spatial disorientation. Spatial disorientation to a pilot means simply the inability to tell "which way is up." According to the FAA Instrument Flying Handbook, AC 61-27C (Section II, Instrument Flying: Coping with Illusions in Flight), an illusion or false impression occurs when information provided by sensory organs is misinterpreted or inadequate. Many illusions in flight could be created by complex motions and certain visual scenes encountered under adverse weather conditions and at night. It also stated that some illusions may lead to spatial disorientation or the inability to accurately determine the attitude or motion of the aircraft in relation to the earth's surface. The AC further stated that the most hazardous illusions that lead to spatial disorientation are created by information received from motion sensing systems, which are located in each inner ear. The AC stated that these undesirable sensations cannot be completely prevented but that they can be ignored or sufficiently suppressed by pilots' developing an "absolute" reliance upon what the flight instruments are reporting about the attitude of their aircraft. EQUIPMENT: All appear badly damaged. NTSB report states "The airplane was equipped with a Garmin G-1000 display. The unit's non-volatile memory card was not located." It also states, "The airplane was equipped with an Electronics International MVP-50 engine monitor. The unit sustained impact damage and the internal non-volatile memory card was not located." DESCRIPTION OF ACCIDENT: Loss of control resulting in inverted ground impact. Heavy damage to cockpit, wings and fuselage. 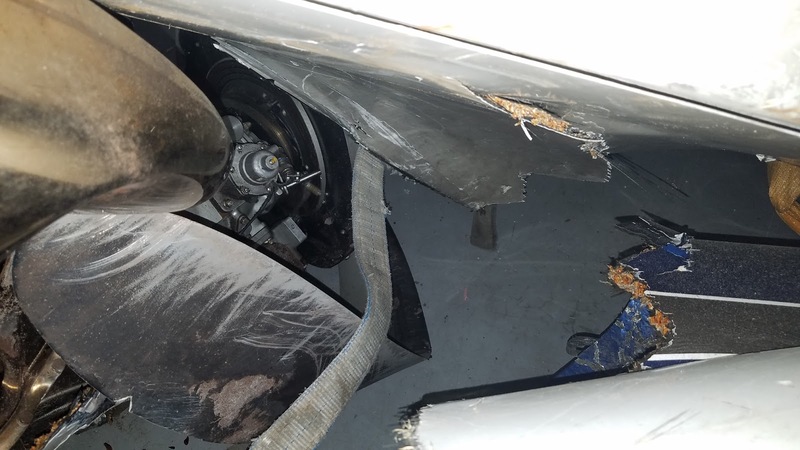 Heavy impact damage to engine and propeller. Some landing gear components may be undamaged due to inverted impact. LOCATION OF AIRCRAFT: Inside a hangar at Florida Air Recovery, Jacksonville, Florida. REMARKS: There are no log books available or Airworthiness Certificate. Salvage sold as is/where is. Inspection of the wreckage is strongly encouraged. Daryl Ingalsbe, pilot, talks in October 2016 about the views he had when he flew around the world. Ingalsbe remembers Russia being the most different place he visited. 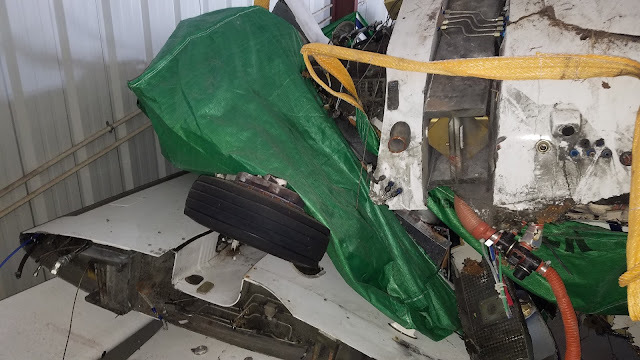 That experimental plane that crashed on December 27, 2016 in the front yard of a home in the Spruce Creek Fly-In community is owned and manufactured by Independent Technologies, which lists Daryl Ingalsbe as the owner and CEO. 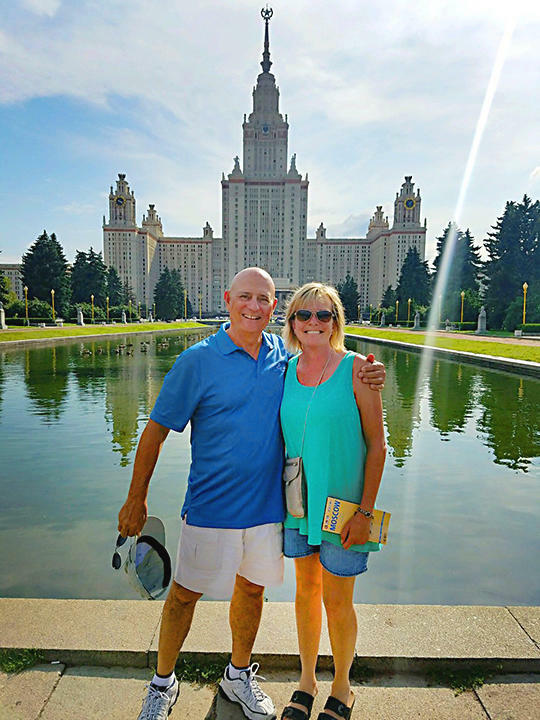 Daryl Ingalsbe of Spicer, left, and Deb Solsrud of New London, pose for a photo in Moscow. NEW LONDON – Funeral services for a New London woman and a Spicer man killed this week in a Florida plane crash are being planned as family and friends mourn their deaths. 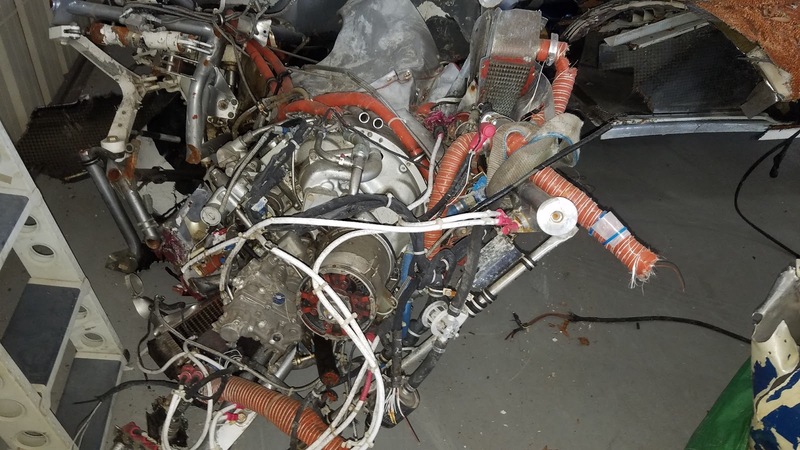 The crash Tuesday night of the 2009 single-engine Epic LT plane – which left the Willmar airport earlier that day – killed the pilot, Daryl Ingalsbe, 67, of Spicer, and Deb Osborn Solsrud, 51, of New London. The two were traveling to Ingalsbe’s second home in Spruce Creek, located near Daytona Beach, Florida. Ingalsbe was president and CEO of Independent Technologies Inc., which is based in Blair, Nebraska, but has multiple branches, including a facility in New London. According to its website, the company sells communication and diagnostic products for telecommunications, power utilities, cable TV, energy and information technology markets. The company issued a brief statement Thursday saying they had “suffered a tragic loss” when Ingalsbe died in the plane crash. “We offer our sincerest condolences and prayers to Daryl’s family, friends and his family of employees,” the statement said. Daryl Ingalsbe and his twin brother, Dave, grew up with “very little” but joined the Army together, studied electronics together and started the business together with several other partners, said Scott Ingalsbe, who is Dave’s son. Last year the team celebrated 30 years of being in business. “They were proud of that, and rightly so,” said Scott Ingalsbe, adding that his uncle remained “humble” despite his business success. He said Daryl Ingalsbe had just spent Christmas with his grandchildren and other family members and was making one of his frequent trips to Florida when the crash happened. Solsrud, who was a well-known and respected professional and volunteer, worked as the community survey program director for School Perceptions, a public opinion research firm for schools. In the past she had been the marketing director for Ridgewater College. Solsrud was an active volunteer in the New London-Spicer School District where district officials praised her work to pass a technology levy for the district and for being a charter member of the Parent Teacher Organization. Ingalsbe and Solsrud had traveled together on the experimental plane before, including a 21-day trip around the world in July with about a dozen other pilots flying similiar Epic airplanes. 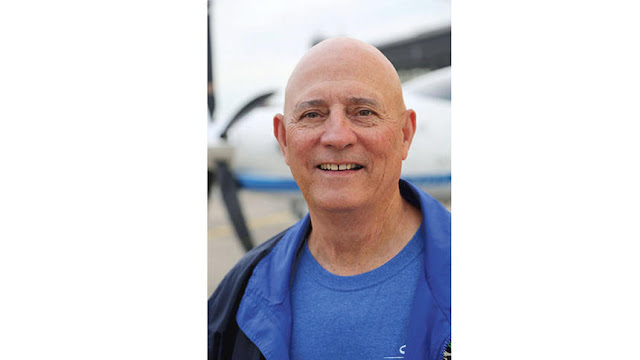 By all accounts, Ingalsbe was an experienced pilot, had no history of accidents and had a medical certification on his license that was up to date, according to information from the Federal Aviation Administration. Preliminary accident information indicates Ingalsbe was attempting to land the plane on a private airport called Spruce Creek as fog was rolling in, reducing visibility. 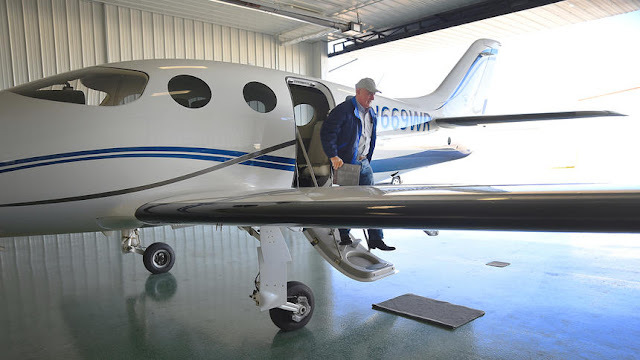 According to aeronautical charts, the small airport is not equipped with services that would help pilots land in inclement weather, unlike the Daytona Beach International Airport located about seven miles away. The Daytona Beach News-Journal reported Thursday that heavy fog in the area at the time of the crash had diverted several commercial flights from Daytona Beach International Airport. Investigators did not say if weather was a factor in the crash. According to the records of the flight pattern, Ingalsbe left the Willmar airport around 12:30 p.m. Tuesday and landed at the Millington, Tennessee, airport at about 2:30 p.m. Central Standard Time. The plane stayed on the ground for less than a half-hour before taking off for the final leg of the trip to Florida. Records indicate the plane was traveling at 27,000 feet and made a steady descent to the runway. Audio between Ingalsbe and a control tower does not indicate there is any concern or problem, said Robert Katz, a corporate pilot and instructor from Dallas, Texas, who closely watches airplane accidents to use as a teaching tool for himself and other pilots. As the plane approached the airport, it was traveling 90 mph at 200 feet when it accelerated and ascended to 700 feet as it apparently missed an attempt to land on the runway. The last reading at 5:57 p.m. shows the plane at 900 feet. The plane crashed at 5:58 Eastern Standard Time in a residential area, narrowly missing two homes. No one on the ground was injured. 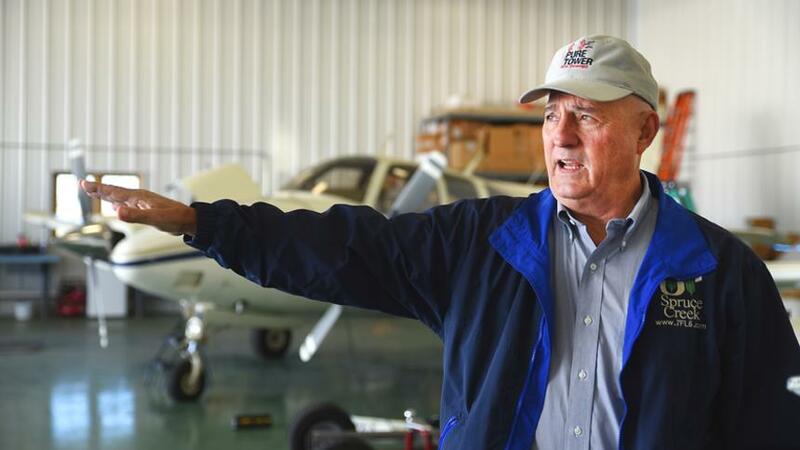 Katz said it can be risky landing at private airports at night and in fog when there are not FAA-approved instrument approach procedures in place. He said it’s possible Ingalsbe became disoriented in the fog, became incapacitated for some reason or perhaps the plane ran out of gas. He said every accident offers unfortunate lessons for other pilots. The FAA and the National Transportation Safety Board are investigating the crash. Funeral services for Solsrud will be at 11:30 a.m. on Jan. 3 at the Max A. Sass & Sons Funeral Service in Muskego, Wisconsin. Visitation will be held a half-hour prior to the service. Funeral services for Ingalsbe are pending with the Campbell-Aman Funeral Home in Blair, Nebraska. 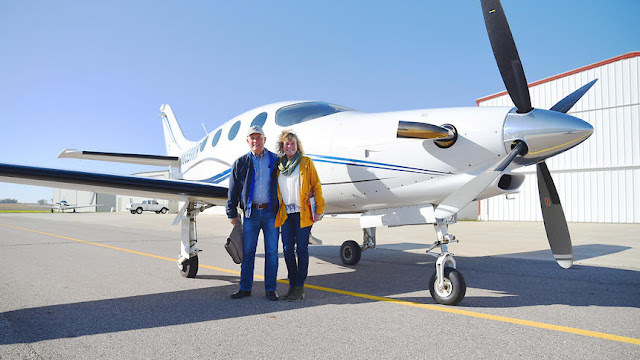 WILLMAR – A Nebraska-based company said this morning that its president, Daryl Ingalsbe, of Spicer, and Deb Solsrud of New London, were killed Tuesday in a plane crash near Inglasbe’s second home in Port Orange, Florida. In a statement issued this morning, Independent Technologies, Inc. confirmed that Ingalsbe, 67, was killed in the accident. The company “suffered a tragic loss” when Ingalsbe died in a plane crash near his home in Spruce Creek, Florida,” the statement read. 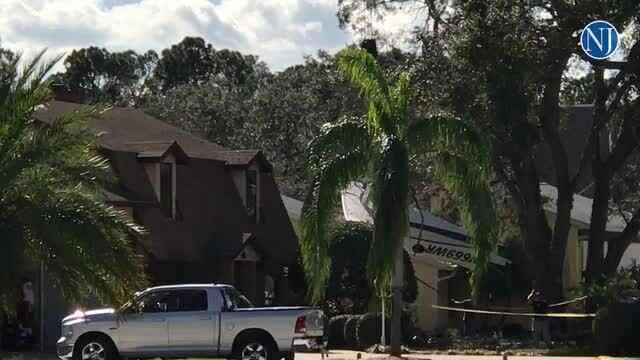 The flight originated Tuesday morning from Willmar and crashed in a residential area of Spruce Creek, located Port Orange, Florida. 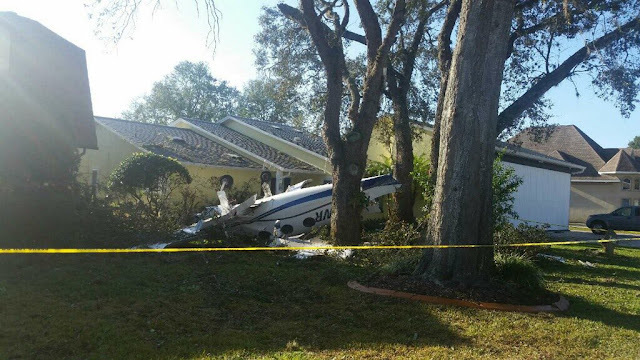 According to the Volusia County Sheriff’s Office, the 2009 single-engine Epic LT plane crashed in fog just before 6 p.m. in a front yard of a fly-In community of Spruce Creek. The plane narrowly missed two houses. No one was injured on the ground. A relative also confirmed today that Ingalsbe was piloting the plane on the night of the crash. In July of this year Ingalsbe and Solsrud were part of a 21-day flight around the world where they flew in Ingalsbe’s experimental airplane. Solsrud is being remembered for her involvement in the New London and Spicer communities, including her volunteer work with the NL-S School District. Deb tragically passed away on December 27, 2016 in a small plane crash in Florida at the age of 51. 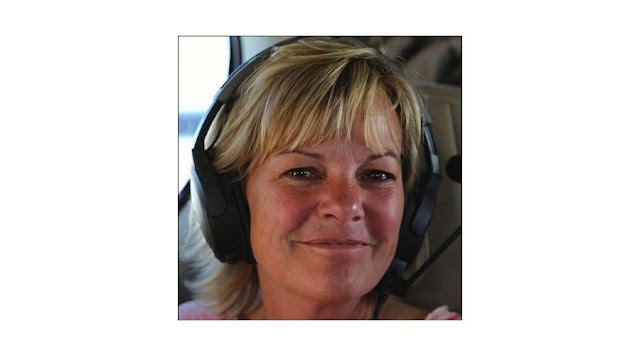 Deb wishes to be best known for her humor, love of adventure and compassion. Deb was born on August 4, 1965 to Guy and Louise (nee Sterling) Osborn in Minneapolis, MN. At the age of 6, the family moved to Milwaukee, WI where she resided until her college days. She received her B.A. in Journalism at the University of Wisconsin-Madison, where her love of adventure truly began! She returned to Minnesota when she was 31, but her love of the Green Bay Packers always followed her. Deb's career in marketing and communications expanded over three decades in education. She hoped to leave the world a better place, so she intended to give back to her favorite charities upon her passing. Deb loved to create, and will be remembered for her baking, knitting and pulling of weeds in her garden so she could have a successful canning year. Deb is survived by her two children, Emma Jean age 14 and Connor Anthony age 13. They were her pride and joy; to whom she gave her heart. She hopes to pass on her humor and love of traveling to each of them, as well as her compassion. She is also survived by her dogs Shiloh and Buster, parents Guy and Louise (nee Sterling) Osborn from Muskego, WI, brother Doug (Kenosha, WI), and sisters Laurie (Steve) from Muskego, WI and Judy (Joel) from Iowa City, IA. Further survived by nieces and nephews, cousins, other relatives and friends. A Memorial Gathering will be held at Max A. Sass & Sons-Westwood Chapel on Tuesday Jan 3 starting at 11AM until the Memorial Service at 11:30AM. A private family burial will take place at Wisconsin Memorial Park at a later date. In lieu of flowers, the family requests memorials be made to a trust account set up for the children or to the New London Spicer School District (www.nls.k12.mn.us) or to Girls United which is in conjunction with the New London Spicer School District and serves youth of the middle school age. Daryl Ingalsbe, pilot, talks in October about the views he had when he flew around the world. Ingalsbe remembers Russia being the most different place he visited. That experimental plane that crashed Tuesday in the front yard of a home in the Spruce Creek Fly-In community is reportedly owned and manufactured by Independent Technologies, which lists Daryl Ingalsbe as the owner and CEO. "Independent Technologies, Inc. suffered a tragic loss on Tuesday December 27th2016 when our President, Daryl Ingalsbe, died in a plane crash near his home in Spruce Creek, Florida. We offer our sincerest condolences and prayers to Daryl's family, friends and his family of employees. We also offer sincerest condolences and prayers to the family and friends of his very good friend, Deb Solsrud of New London, Minnesota, who also died in the crash." The pilot in Tuesday's double-fatal plane wreck "crashed on go around after a missed approach," Eric Weiss, spokesman for the National Transportation Safety Board, said Wednesday. 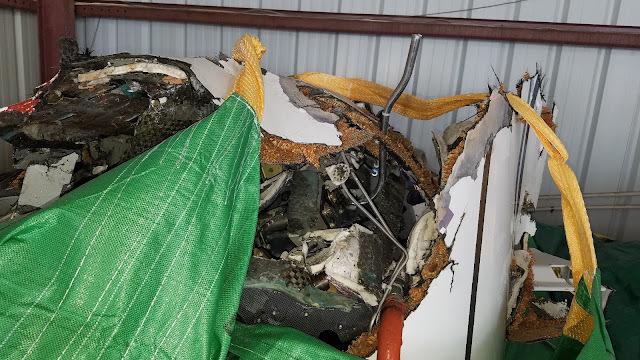 Weiss said that was all he could confirm about Tuesday evening's plane crash in the Spruce Creek Fly-In pending the outcome of the investigation. The identities of the two people killed were not confirmed Wednesday afternoon as law enforcement officials were still trying to locate next of kin, according to the Volusia County Sheriff's Office. Records show the plane is owned by Daryl Ingalsbe, who has a home in the Fly-In and is the president and CEO of Independent Technologies, Inc., based in Nebraska. 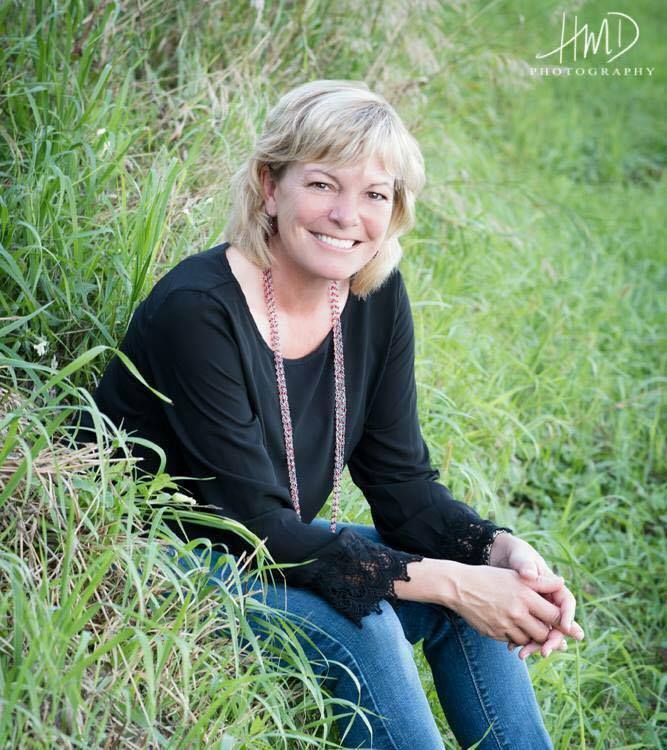 The New London-Spicer School District in Minnesota posted to the district's Facebook page that the community was mourning the loss of former parent-teacher organization president Deb Solsrud "who passed away when the small plane she was traveling in crashed in Volusia County." Brad Andersen with Independent Technologies said the company could not comment Wednesday but would issue a statement today. Ingalsbe and Solsrud took a 21-day trip together around the world in the experimental plane in July, according to the West Central Tribune, a Minnesota newspaper. Emergency crews were summoned to the private community about 6 p.m. Tuesday when witnesses reported a plane had crashed on Taxiway Lindy Loop. Volusia County Sheriff Ben Johnson said the pilot, believed to be a resident of the Fly-In, narrowly missed hitting a couple of houses. "It looks like there's not going to be any survivors in this," a 9-1-1 caller said. The flight of the Epic LT single-engine aircraft originated out of Tennessee's Regional Jetport, according to the Federal Aviation Administration. Another 9-1-1 caller said the plane entered the thick fog and came out in "an inverted flat spin." A plane in an inverted flat spin is like "a falling leaf," Joe Friend, manager of Spruce Creek Airport, said Wednesday. "The airplane is not considered to be flying at that point," Friend said. A visibility of 2.5 miles was reported to the National Weather Service from the Spruce Creek Airport at 5:55 p.m., shortly before the deadly crash. The dense fog affected the schedules of planes that were supposed to land Tuesday afternoon and evening at Daytona Beach International Airport. A Delta flight from Atlanta scheduled to arrive in Daytona Beach at 4:45 p.m. wasn't able to land until 5:30 p.m. while another Delta flight out of Atlanta scheduled to land in Daytona Beach at 8:46 p.m. was diverted to Orlando where it landed at 9:36 p.m., said Jay Cassens, director of business development at Daytona's airport. An American Airlines flight originating from Charlotte and scheduled to land at Daytona at 9:13 p.m. was canceled. Cassens said he was surprised to see another American Airlines flight out of Charlotte landed in Daytona on time at 5:18 p.m. when less than 1 mile of visibility had been reported. Friend said without the Fly-In having its own tower, details about the severity of weather conditions are only so precise from air traffic controllers working 11 miles to the north in Daytona Beach. Nine other fatalities have been reported at the Fly-In since 1993, according to FAA records. Thirty-nine aviation accidents have been investigated there since 1982. Yellow police tape had been strung up across both ends of Lindy Loop in an effort to keep the curious at bay Wednesday afternoon. Lindy Loop is a taxiway that runs parallel to the Fly-In's runway and is only separated from the flight strip by a row of houses. Security guards stood at both ends of the street as residents flocked to the scene to take pictures and shoot video of the downed plane, even if from a distance. A yellow crane stood in place in front of the house ready to lift the destroyed aircraft from a front yard on Lindy Loop. Once the plane was secured, a handful of NTSB investigators began to yell instructions at the crane operator. The plane slowly became airborne, it's crushed nose visible as it lifted over the trees and swung around toward the street. It was gently lowered onto the bed of a truck and the onlookers began walking away. NEW LONDON – The New London-Spicer School District is mourning the loss of a community member who was reportedly killed Tuesday in a Florida plane crash. A statement issued Wednesday by NLS Director of Communications Megan Field says that Deb Solsrud died when the small plane in which she was traveling crashed in Volusia County in east central Florida. According to the Volusia County Sheriff’s Office, a 2009 single-engine Epic LT plane crashed in heavy fog just before 6 p.m. in a front yard in the Spruce Creek Fly-In community of Port Orange, Florida. The pilot and Solsrud were killed. The plane is reportedly owned by Independent Technologies, which lists Daryl Ingalsbe as the president and CEO. Ingalsbe, a pilot, has a home in Spicer and Florida. When contacted at the Independent Technologies headquarters in Blair, Nebraska, a representative said the company was not prepared to make a statement today regarding Ingalsbe but would likely do so on Thursday. In July, Ingalsbe and Solsrud took a 21-day trip around the world together in the experimental plane. In its statement, the NLS school district said Solsrud was a “loving parent” and involved community member. 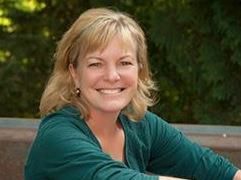 She was a charter member and former president of the NLS Parent Teacher Organization, coordinated the inaugural event for the Girls United program that served middle school-aged girls and she worked to pass the technology levy for NLS several years ago. Brad Andersen with Independent Technologies said the company could not comment Wednesday but would issue a statement Thursday. PORT ORANGE, Fla. - Two people were killed in a plane crash Tuesday evening in Port Orange, officials said. 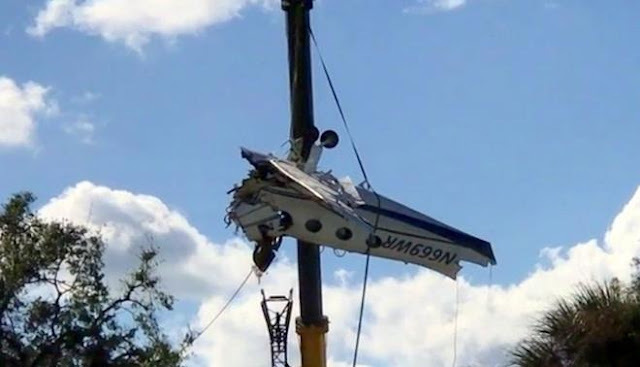 The pilot and a passenger were on board a 2009 Epic LT single-engine aircraft that went down at the Spruce Creek Fly-In, officials said. 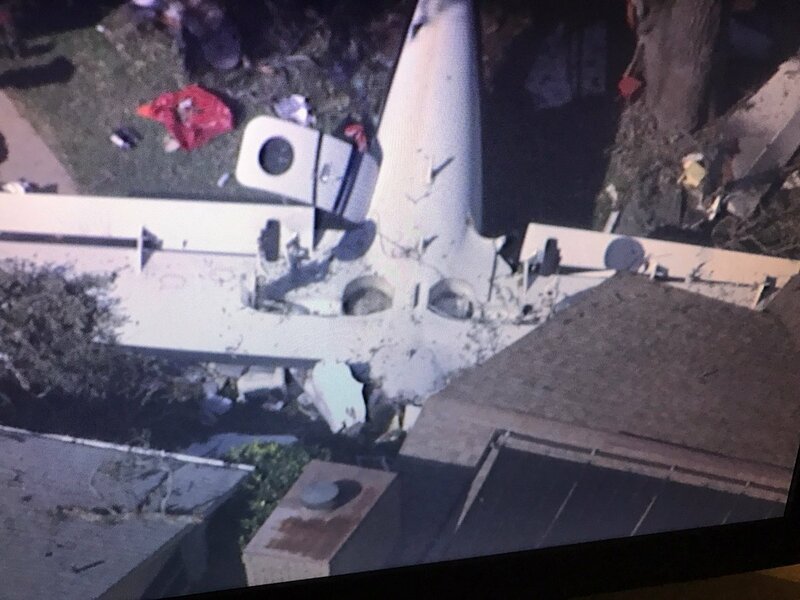 The plane came close to hitting several homes. The aircraft stalled while trying to land, said officials with the Volusia County Sheriff’s Department. Something went wrong, but the specifics aren’t clear. Sheriff’s officials said the wreck took place about 6 p.m. in the area of 22 Taxiway Lindy Loop. The plane was "in an inverted flat spin when he came out of the fog," a witness told officials. "He came right over the house. I knew he was in trouble." 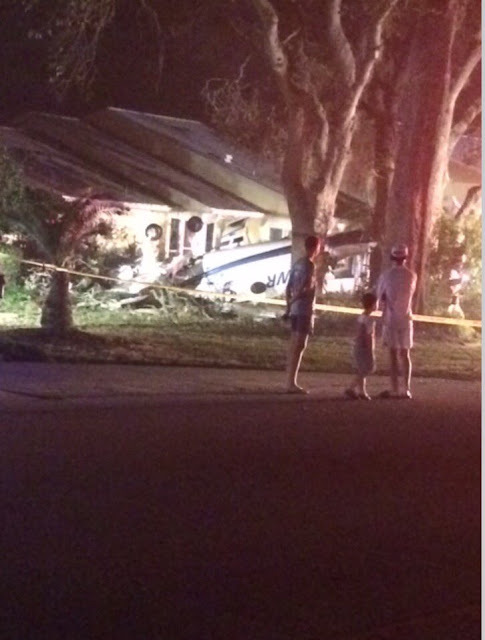 While the plane crashed into a yard, it missed striking any homes in the neighborhood. No injuries were reported on the ground. "It looked like it was right at the front door of the house. God bless them it didn't go into the houses there," Pat Waggnor who lives in the area said. Witnesses told National Transportation Safety Board officials the plane crashed after missing its approach. Local authorities will release the names and conditions of the people who were in the plane. The flight originated at Millington Regional Airport in Tennessee, officials said. The Federal Aviation Administration and NTSB will investigate the crash. Investigators were on scene documenting the wreckage, searching for clues, and interviewing witnesses to determine the cause of the crash. It may take up to a year to determine the cause of the crash, NTSB Public Information Officer Eric Weiss told News 6. Crews removed the wreckage from the site Wednesday evening. WILLMAR – A plane reportedly owned by a Spicer businessman crashed in a residential neighborhood in Florida Tuesday night, killing both people on board. 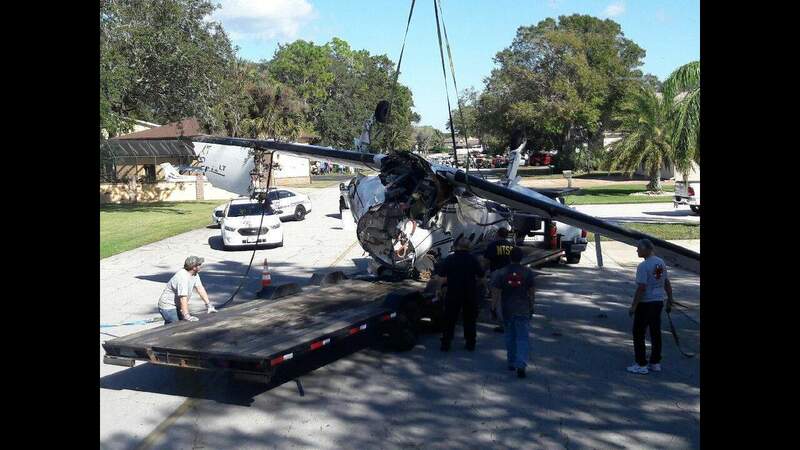 According to the Volusia County Sheriff’s Office, the 2009 single-engine Epic LT plane crashed in heavy fog just before 6 p.m. in a front yard in the Spruce Creek Fly-In community of Port Orange, Florida. The plane narrowly missed two houses. No one on the ground was injured but two people in the plane were killed. The names of the victims have not been yet released but according to a story published in the Dayton Beach News-Journal, an Epic aircraft with the FAA registration of N669WR left Willmar on Tuesday and after stopping in Tennessee was scheduled to arrive at Spruce Creek at 5:58 p.m.
That experimental plane is reportedly owned and manufactured by Independent Technologies, which lists Daryl Ingalsbe as the owner and CEO. Besides having a residence in Spruce Creek Fly-in, Ingalsbe also has a home in Spicer. 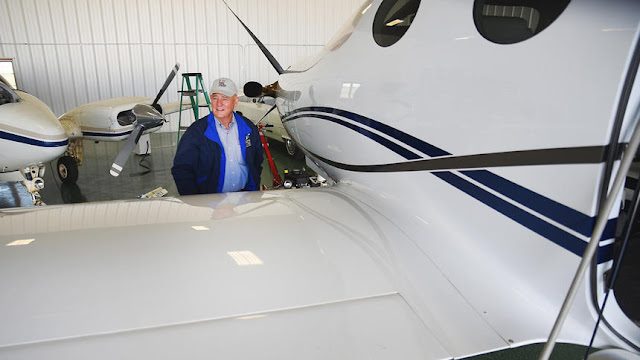 Earlier this year, the West Central Tribune featured Ingalsbe in an article about a 21-day trip around the world where he flew his fixed wing, single-engine turboprop Epic airplane – along with his partner and New London businesswoman, Deb Solsrud – with two dozen other aviation enthusiasts. 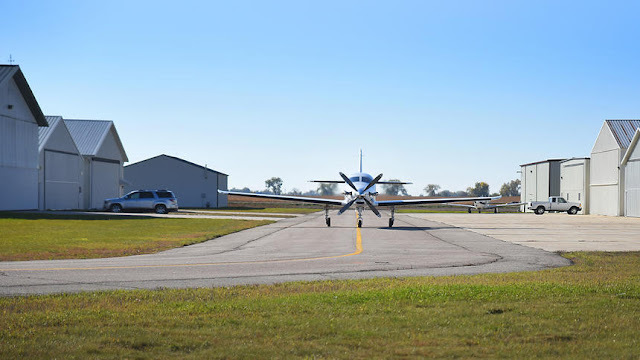 Named the “Odyssey,” the trip was the first of its kind to incorporate experimental aircraft and included other owners of Epic planes as well as a documentary film crew. That trip, which was expected to be recognized by Guinness World Records, began July 7 and included stops in 21 cities in countries on three continents. 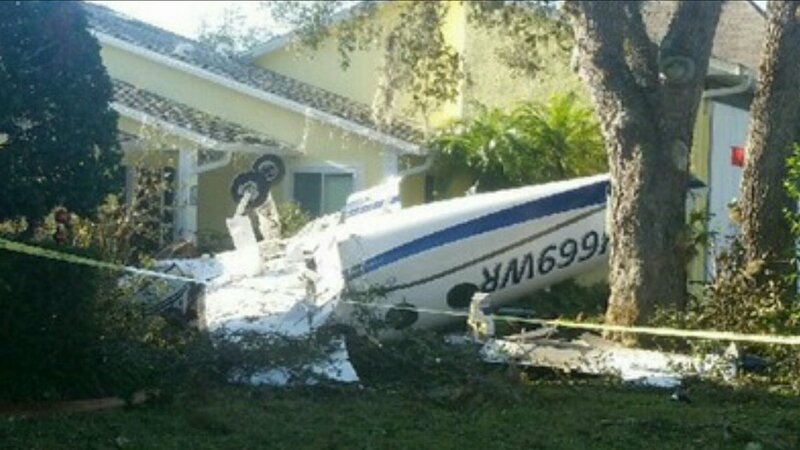 Volusia County Sheriff Ben Johnson told the News-Journal it looked like the plane stalled or came down in a spin. "It came pretty much straight down," Johnson said. "It appears as though it barely missed two houses." The Federal Aviation Administration and National Transportation Safety Board are investigating. 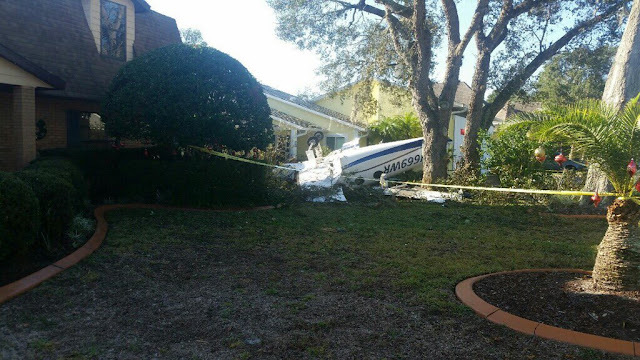 Two people were killed Tuesday evening when an airplane crashed into the front yard of a home in the Spruce Creek Fly-In community. The plane crashed on Taxiway Lindy Loop just before 6 p.m., said Andrew Gant, a Volusia County sheriff's spokesman. 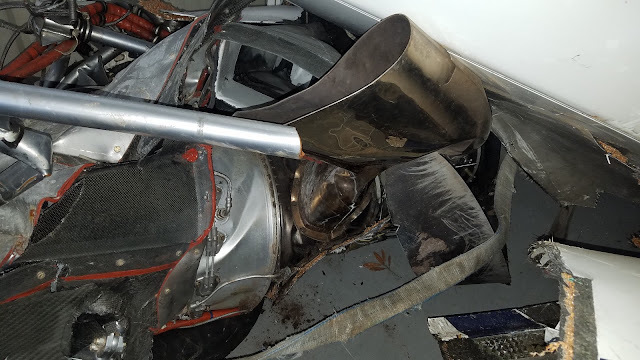 The Epic LT, high performance, all carbon fiber, single-engine turboprop aircraft, crashed on approach to Runway 5 at Spruce Creek Airport, Kathleen Bergen, spokeswoman for the Federal Aviation Administration, said via email. The identities of the two victims would be released after their families were notified, Gant said. No other injuries were reported. A 9-1-1 caller told a dispatcher he saw the plane fly into the fog and when it came out it was "in an inverted flat spin." "He came right over the house - I knew he was in trouble," the caller said. The dispatcher asked the caller if he thought anyone was injured to which the caller responded: "They're probably dead." Another 9-1-1 caller told a dispatcher it looked like there wouldn't be any survivors. Volusia County Sheriff Ben Johnson said it looked like the plane stalled or came down in a spin. Johnson said one of the victims was apparently someone who lives in the fly-in community. "At the time, I think the fog was starting to set in," the sheriff said. "The FAA will investigate this to find out what really happened." The flight originated out of Millington Regional Airport in Tennessee, Bergen said. 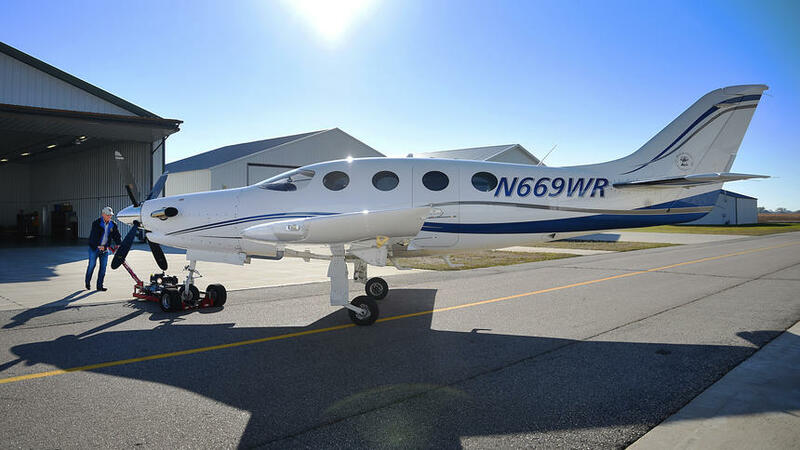 According to Flight Aware, a flight tracking website, an Epic aircraft, N669WR, departed Millington Regional Jetport in Tennessee at 2:58 p.m. Tuesday and was scheduled to arrive at Spruce Creek at 5:58 p.m. The fog started rolling into the Port Orange area before 5 p.m. Tuesday. "The fog is developing over the nearshore Atlantic because of a combination of cooler water and relatively warmer air," said John Pendergrast, a meteorologist with the National Weather Service in Melbourne. The Weather Service received an automated observation from the airport at Spruce Creek at 5:55 p.m., Pendergrast said. "The weather observation at the time indicated it was 2.5 mile visibility, with no wind and 100 percent humidity," Pendergrast said. "You can conclude from that there was obscuration of visibility." Information on the Epic Aircraft website indicates Daryl Ingalsbe of Spruce Creek owns one of its aircraft. Volusia property records show Ingalsbe owns a home in the Fly-In. The FAA registration for N669WR indicates it was a fixed wing, single-engine turboprop owned and manufactured by Independent Technologies Inc. of Bend, Oregon. Records on file with the Florida Department of State list Ingalsbe as an officer in the company, Independent Technologies. The registration states the Epic Aircraft plane is classified as an experimental aircraft, in the category of amateur built, which covers a broad range of aircraft within the agency's classification system. The plane had flown into Tennessee earlier Tuesday from Willmar Municipal Airport in Willmar, Minnesota, the flight tracking service reported. On Monday, the plane was flown from Fremont, Nebraska to Minnesota, the reverse of a flight the plane made on Friday. Flight Aware shows the plane was flown from Spruce Creek to Willmar, Minnesota on Dec. 18. The National Transportation Safety Board also was notified, the Sheriff's office stated. 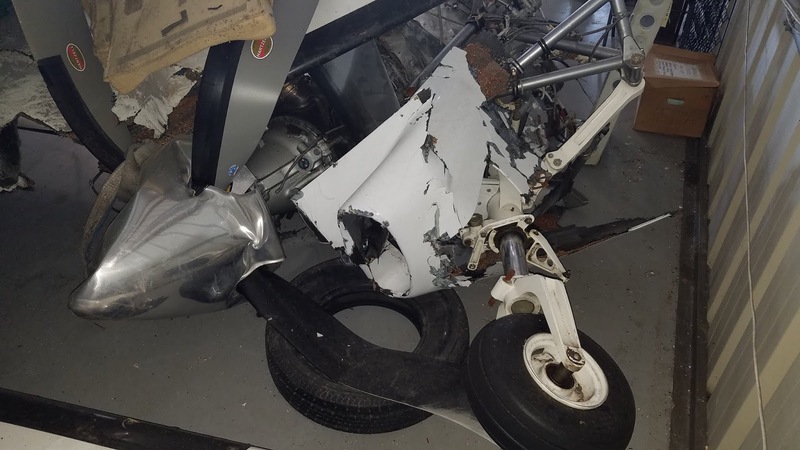 On December 27, 2016, about 1757 eastern standard time, N669WR, an experimental amateur-built Epic LT, sustained substantial damage when it impacted terrain while executing an instrument approach to Spruce Creek Airport (7FL6), Port Orange, Florida. 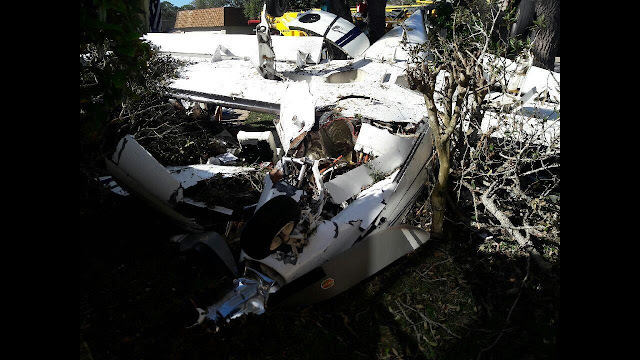 The private pilot and his passenger were fatally injured. Instrument meteorological conditions prevailed for the flight that originated at the Millington Regional Jetport (NQA), Millington, Tennessee about 1558 and was destined for 7FL6. An instrument flight rules flight plan was filed for the personal flight conducted under 14 Code of Federal Regulations Part 91. Several witnesses observed the accident. According to a witness, who was driving to the airport's café, he saw the airplane's landing lights as it approached the airport. The airplane was about 100 feet above the ground and in a left turn. The airplane then climbed back into the fog layer and disappeared from view. The witness said, "I didn't hear anything for a few seconds. Then I heard a very loud distinct corkscrewing sound, very familiar to a spinning plane at an airshow. I then saw two wing-tip lights fall through the clouds straight down and heard an extremely loud thud." Another witness, who was also a Designated Pilot Examiner, said he saw the airplane when it broke out of the overcast about 200 feet above ground level (agl). At that time, the airplane was about 1/8th of a mile to the north of the final approach course. He said the airplane then suddenly pulled up and banked to the right over the airport into the fog, before it descended in an inverted flat spin to impact. A third witness said he heard a loud engine noise so he went out onto his lanai and looked up. He saw the airplane emerge from the fog in a 70 to 80-degree nose down "fully developed spin," The witness said the airplane made three rotations before he lost sight of it behind trees followed by the sound of an impact. Review of preliminary radar data provided by the Federal Aviation Administration (FAA) revealed that over the final 46 seconds of flight, the airplane approached the airport on a north-easterly heading just north of the final approach course. At 1756:01, the airplane was abeam the runway numbers at an altitude of 100 feet mean sea level (msl) before it initiated a climbing right turn to 200 feet msl over the airport. The airplane continued to turn right and descended back down to 100 feet msl before it climbed back up to 300 feet while still in the turn. At 1756:33, the airplane leveled out and began to climb on a northeasterly heading. Over the next 13 seconds the airplane climbed to 800 feet making a shallow turn to the right followed by a turn to the left before the data ended at 1756:47. The last radar return was near-coincident with the location of where the airplane impacted the ground. 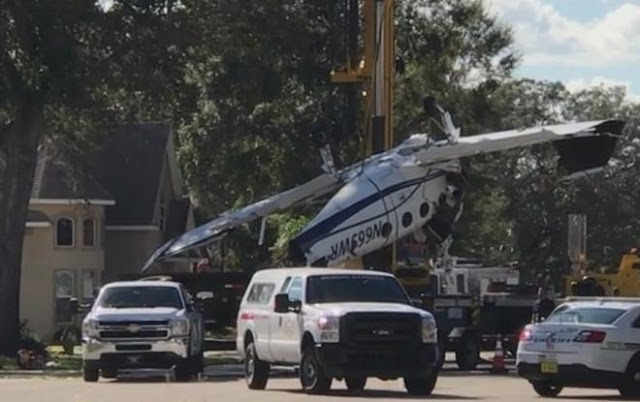 The airplane came to rest inverted at the base of an approximately 50-foot-tall tree on the front lawn of a private residence. All major flight controls were accounted for at the site and there was no post-impact fire. The airplane collided with tree limbs during the impact sequence. An outboard section of the left wing, a section of the left wing's fuel line, tail section and the rudder separated from the airframe. There was little evidence of forward movement of the airplane. Examination of the airframe revealed the carbon-composite fuselage sustained extensive fracturing. Both wing fuel tanks were breached and a strong odor of jet fuel permeated the wreckage. Flight control continuity was established for all major flight controls to the cockpit. The landing gear was in the fully down and locked position and the flaps were fully extended. The fuel selector was set to the left wing fuel tank. The engine and the four-blade propeller assembly remained attached to the engine. 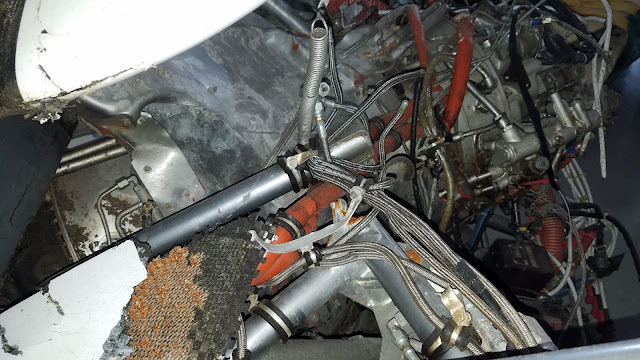 When the engine was separated from the airframe, fuel was observed draining from the main fuel line. The pilot held a private pilot certificate with ratings for airplane single and multi-engine land, and instrument airplane. His last FAA third-class medical was issued on December 2, 2016. At that time, he reported a total of 5,635 total flight hours. Weather reported at 7FL6 at 1755 was calm wind, visibility 2.5 statute miles, mist, temperature 19 degrees C, dewpoint 19 degrees C, and a barometric pressure setting of 30.18 inches Hg. 7FL6 is not equipped to provide ceiling heights. Weather reported at New Smyrna Beach Municipal Airport, (EVB), New Smyrna Beach, Florida, about 5 miles east of the accident site at 1750, was wind from 090 degrees at 4 knots, visibility 1/4 statute mile, fog, overcast 100 feet, temperature 19 degrees C, dewpoint 19 degrees C, and a barometric pressure setting of 30.18 inches Hg. This incorrectly reports that there are no instrument approaches into Spruce Creek. There is a GPS approach to runway 5, and as a resident/owner there, this pilot would have had (or at least had access to) the approach/briefing plate. This appears to be nearly for certain a stall/spin crash caused by too little airspeed while initiating the left turn, which is made unusually (and I believe somewhat unsafely) difficult at Spruce Creek by the Class Charlie (C) airspace above from Daytona Beach. That should not have affected this flight as an IFR flight (i.e. that rule would not apply here) but pilots used to flying in and out of Spruce Creek habitually know to turn hard and stay low on the left turn when departing runway 5, just as this pilot was effectively doing in a go-around maneuver. I suspect that habitual pattern may have bitten this pilot here, while he was low and slow and doing more in a go-around maneuver than a normal take off procedure has one thinking about. The correct go-around procedure would have been to fly straight ahead, not make the left turn into the normal airport pattern. Sometimes habits save you, sometimes maybe they can kill you. "There is a GPS approach to runway 5"
Link to the published approach, please. residents with the approved and number approach plate assigned to them may utilize this procedure. Too much airplane, not enough pilot. The ending was predictable.